Before you begin to study the different structures and functions of the human body, it is helpful to consider its basic architecture; that is, how its smallest parts are assembled into larger structures. It is convenient to consider the structures of the body in terms of fundamental levels of organization that increase in complexity: subatomic particles, atoms, molecules, organelles, cells, tissues, organs, organ systems, organisms and biosphere (Figure 1). Figure 1. Levels of Structural Organization of the Human Body. The organization of the body often is discussed in terms of six distinct levels of increasing complexity, from the smallest chemical building blocks to a unique human organism. A human cell typically consists of flexible membranes that enclose cytoplasm, a water-based cellular fluid together with a variety of tiny functioning units called organelles. In humans, as in all organisms, cells perform all functions of life. A tissue is a group of many similar cells (though sometimes composed of a few related types) that work together to perform a specific function. An organ is an anatomically distinct structure of the body composed of two or more tissue types. 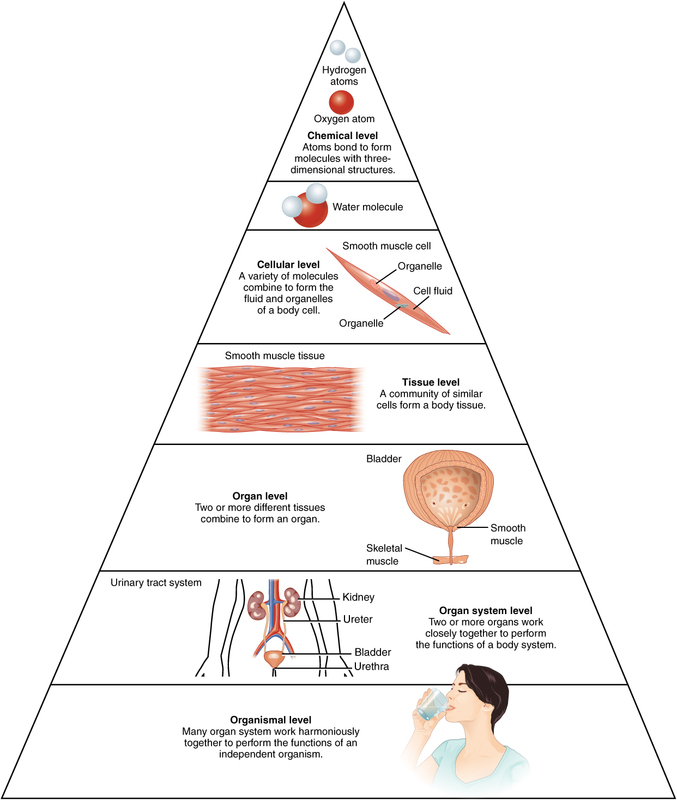 Each organ performs one or more specific physiological functions. An organ system is a group of organs that work together to perform major functions or meet physiological needs of the body. This book covers eleven distinct organ systems in the human body (Figure 2 and Figure 3). Assigning organs to organ systems can be imprecise since organs that “belong” to one system can also have functions integral to another system. In fact, most organs contribute to more than one system. Figure 2. 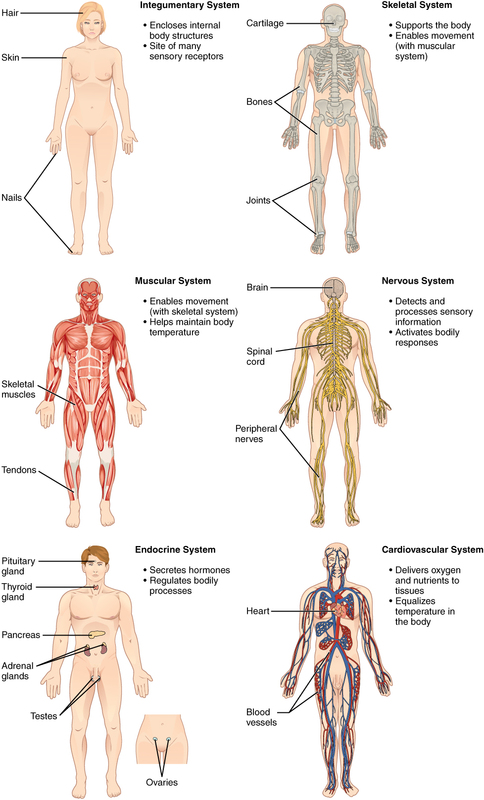 Organ Systems of the Human Body. Organs that work together are grouped into organ systems. Figure 3. 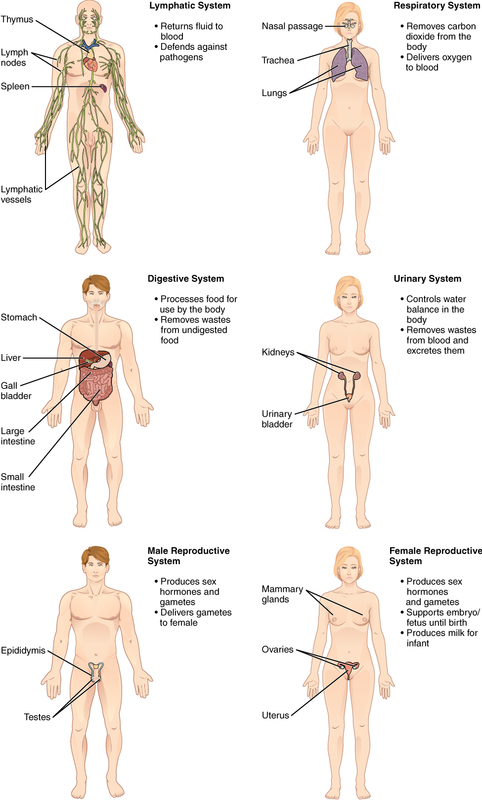 Organ Systems of the Human Body (continued). Organs that work together are grouped into organ systems. 1. The smallest independently functioning unit of an organism is a(n) ________. 2. A collection of similar tissues that performs a specific function is an ________. 3. The body system responsible for structural support and movement is the ________. 1. Name the six levels of organization of the human body. 2. The female ovaries and the male testes are a part of which body system? Can these organs be members of more than one organ system? Why or why not? Chemical, cellular, tissue, organ, organ system, organism. The female ovaries and the male testes are parts of the reproductive system. But they also secrete hormones, as does the endocrine system, therefore ovaries and testes function within both the endocrine and reproductive systems. 1.2 Structural Organization of the Human Body by Rice University is licensed under a Creative Commons Attribution 4.0 International License, except where otherwise noted.